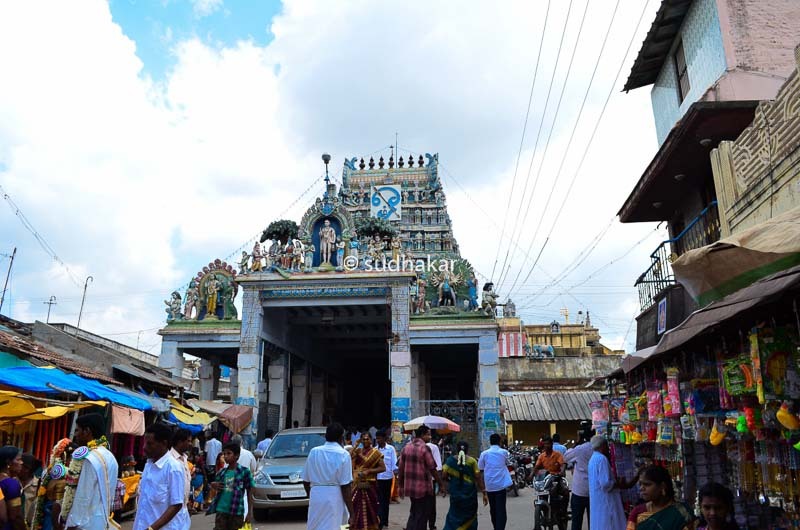 Swamimalai Murugan Temple is located in Swamimalai, 7 km from Kumbakonam on the banks of a tributary of river Cauvery. It is one of the six "aru padai veedu" (six abodes of Lord Muruga) . As per mythology , sage Bhrugu before commencing a very difficult penance, got a boon that anyone disturbing his meditation will forget all his knowledge. Such was the power of the penance that the heat from the penance reached the Heaven, and the frightened devas surrendered to Lord Siva to save them. The Lord came down to Bhrugu and he woke up from the penance and, as per Bhrughu's boon whoever disturbs him will lose his knowledge, Lord Siva lost his knowledge. Bhrughu got very upset saying he became the cause for Siva to lose his knowledge. Lord Siva said pacified him saying that he will regain all these soon by his son. Meanwhile once when Brahma, was proceeding to Kailash, child Lord Muruga asked him for the meaning of the Pranava mantra 'AuM'. When Brahma blinked and could not answer correctly, Muruga imprisoned him. With Brahma in a prison, all creations came to a standstill and the devas prayed to Lord Siva to get Brahma released. Siva came to Muruga and ordered him to release Brahma from imprisonment. Muruga refused and said that the imprisonment was a punishment for the ignorance of Brahma for not knowing the meaning of Pranava mantra being a creator. Lord Siva asked him whether Muruga knew the meaning of the Pranava mantra AuM. Lord Muruga said that he knew the meaning and can offer it to the Siva only if he can accept him as a guru and listen to the explanation as a devoted disciple. 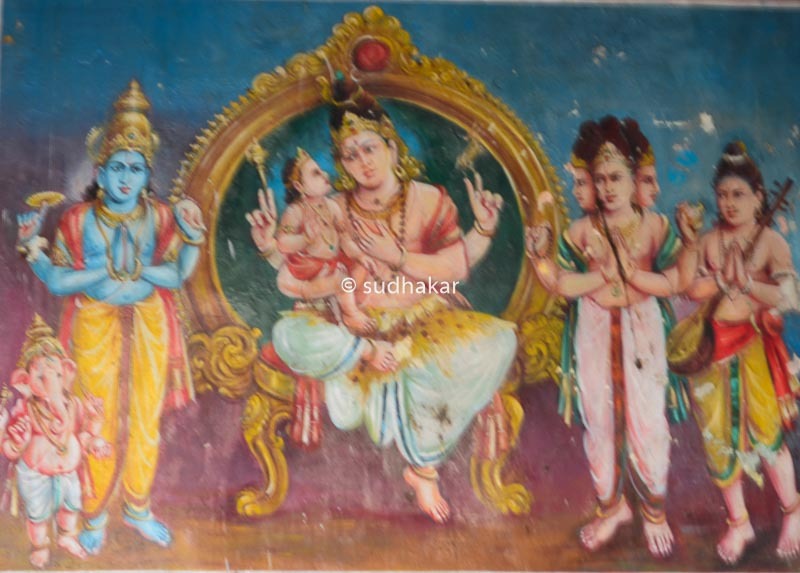 Lord Siva acceded to the request of Lord Muruga and heard the exposition of AuM as a disciple, the place came to be known as Swamimalai and the presiding deity as Swaminathan. The temple is built on man made hillock of about sixty feet height with sixty stone steps leading to the temple. Each step represents the Hindu cycle of sixty years. 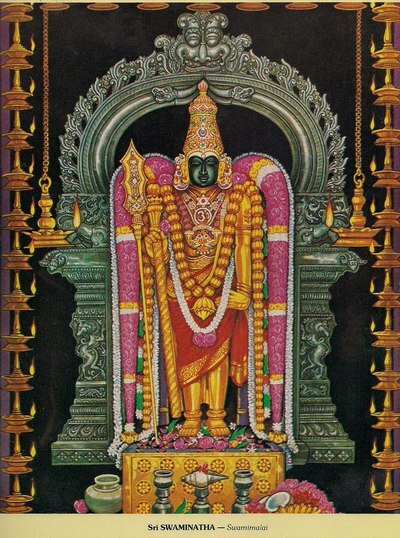 Hymns in praise of Muruga have been sung by saint Nakkeerar in Tirumurukatrupadai and by Saint Arunagirnathar in Tiruppukazh. The temple is said to be in existence from 2nd century BC. 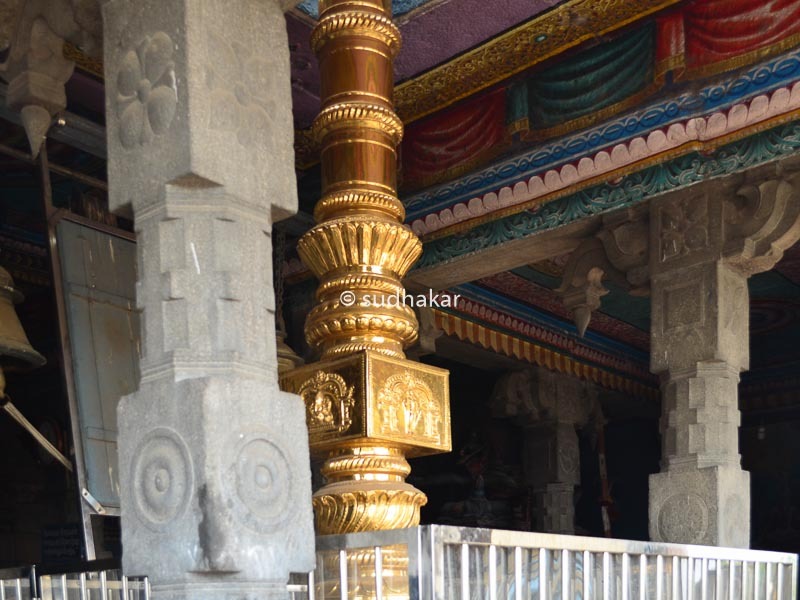 The temple was believed to have been built by Parantaka Chola I. The temple has three gopurams and three praharams. 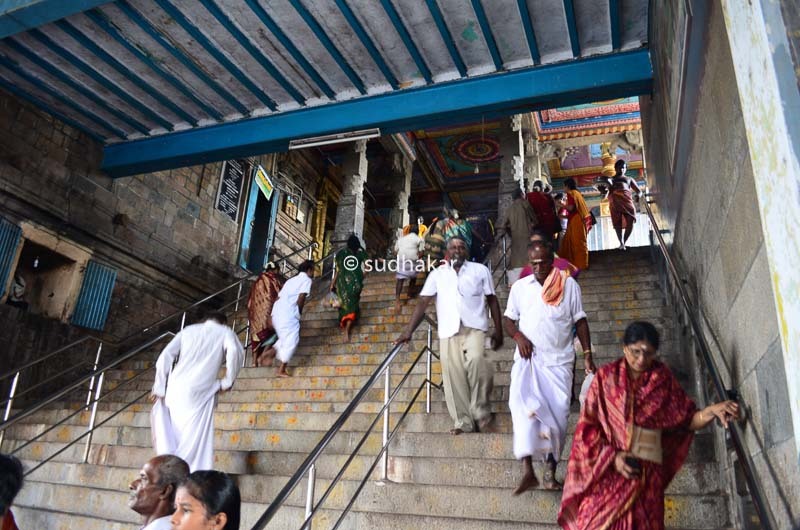 Out of the three praharams, one is at the foothill, the second at midway to the top of the hillock and the third around the sanctum of the Swaminathaswamy shrine. In the first praharam we can see the shrines Dakshinamurthy, Durga, Chandikeswarar and the utsavar of Swaminathaswamy. The second praharam is large and has a marriage hall and the chariot of the temple. Many marriages takes place in this hall and people come all over the state to get married here. As you climb the sixty steps, you enter the main sanctum of the temple. You can see the Iravatham ( Indra's white elephant) in front of Lord Muruga. It is an unique feature as all other Murugan temples has Peacock in front of the Lord.The idol of Swaminathaswamy stands majestically at 6 ft with golden a lance studded with diamonds in his right hand ( usually on special occassions) and other hand on his hips. Like other Murugan temples, the Lord here is anoited with sandal paste and pancahmirtham ( milk,honey,banana,ghee and jaggery- five compounds) as abishekams at specific pooja times. Devotees offer their hair ( it is very popular in Tirupathi Balaji temple, and other Murugan temples in the South) as a sacrifice after their prayers have been answered. The temple has a golden chariot made of seven kilos of gold, 85 kilos of silver and other metals. Devotees on payment of stipulated fees can take the deity in a procession in the golden charriot around the outer corridor. Other important ritual is carrying of palkudams (milk pots) and Kavadi by the devotees in huge numbers. Daily pujas to the deities are performed six times a day. Monthly Krithikai festival, Visakam festival in May, Navarathri festival in May, the important Skanda Sashti festival during October,Thiru Karthikai in Nov/December, Thai poosam in January and Pankuni Uttiram in festival are celeberated in a very grand scale. Unprecedent crowds throng the temple during theses festival days. During marriage muhurat days, the temple corridor overflows with people, it is very difficult to enter into the temple. Parkig of your car is a real night mare during these days. Temple Timings It is normally open from 5 am – 12:00pm and 4.30pm- 8:00pm. 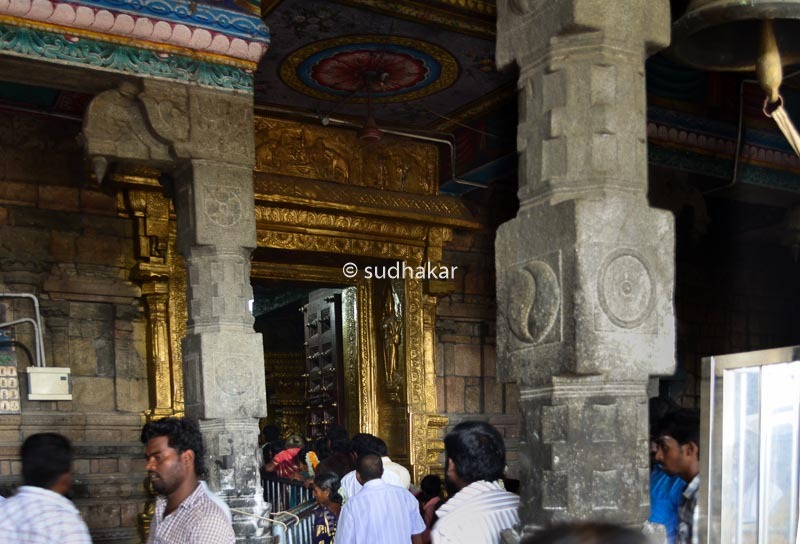 The temple is located at 7 Kms from Kumbakonam. Plenty of local buses,cabs and auto rickshaws are available from Kumbakonam. Where to Stay?There are plenty of budget and semi deluxe hotels are in Kumbakonam. If you are not staying at Kumbakonam and are travelling only to Swamimalai, there are rooms and cottages constructed and are let out at nominal rent ranging from Rs. 20/- to Rs. 100/- per day by the temple Devasthanam. Places nearby Kumbakonam is a place with many famous temples. Oppiliappan temple, Patteeswaram Durgai, Darsuram, Thirubhuvanam are very nearby.